Using implicit differentiation to find dy/dx. I’ve included two different sizes of the same puzzle. 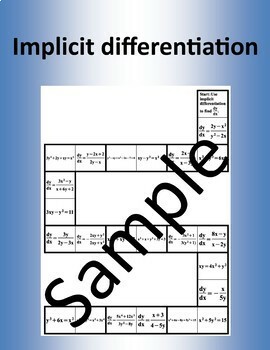 The smaller size is only two pages and it great if you are going to print of individual copies for students to practice with in class or at home. The larger size requires 8 pieces of paper and quite a bit of space to solve – fun for centers and group work! I’ve been using these puzzles for years with great success! I recommend printing the puzzles on colourful paper and laminating them. This way you only have to cut them out once and they will last year after year!